Two awards-worthy films out this week! Don't miss 'Call Me By Your Name' or 'Darkest Hour'... Alicia Malone will tell you why. Also at home, there's 'Kedi,' 'Brigsby Bear,' and 'Logan Lucky' on Fandango NOW. Looking for movie tickets? 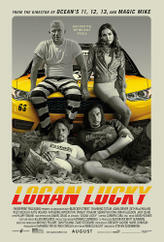 Enter your location to see which movie theaters are playing Logan Lucky near you.